A scatterplot is a mathematical diagram using Cartesian coordinates to display values for two variables for a set of data. 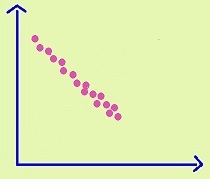 The scatterplot matrix is created by working with both negative and positive values. Usually scatterplots are used for displaying large databases of exacting numeric value, but it is possible to use scatterplots to display broad approximations of distance in qualitative categories. The diagrams here represent degrees in the positions between viewpoints and the numeric values on the scale and because they are highly interpretative, they must not be seen as mathematic measurements. Using quantifying tools for measuring social interaction is problematical, but they have yielded insights about groupings and relationships. … Yet, a challenge appears once we wish to plot this correlation matrix. The challenge stems from the fact that the classic presentation for a correlation matrix is a scatter plot matrix – but scatter plots don’t (usually) work well for ordered categorical vectors since the dots on the scatter plot often overlap each other. Galili has four solutions, but my development of a scatterplot matrix avoids the problem through simplicity. I won’t be foolish enough to try and display as many Queensland thinkers as I can together. Instead, I will create thematic scatterplot matrixes which will display no more than a dozen Queensland thinkers in the one diagram. The two variables being ‘measured’, that is, measured as an interpretative score, are the ‘Belief (X) Scale Value’ and the ‘Socio-Political (Y) Scale Value.’ The Belief (X) Scale Value conveys the intensity or the nature of the belief response, from the most dogmatic responses to the most disinterested. The Socio-Political (Y) Scale Value conveys the theoretical content, from most ‘libertarian’ viewpoint to the most hegemonic. As often can be the case with scales, those positions at the extremes can circle around to meet at very similar outlooks or responses. These assessments are made very generally about the tone of the person’s pronouncements and associations. It is clear from the start that all persons are, in some particular way, contradictory in their demeanour and thinking. The assessments in the project are very general to start with. In time, scatterplot matrixes can be constructed to drill down to map positions according to specific questions or themes. Accuracy is not denied but, in the process, it is a work-in-progress. On both X and Y scale, the position ‘0’ is a neutral zone of assessment, meaning that because available information is unclear, judgement is suspended for the time being. Thinkers are parked in this neutral zone until further research can possibly ascertain a better direction to place the thinker on the scale in question. One direction (negative) on the X scale is the movement towards dogma, from ordinary belief to a ritualism which has strangely gone beyond concern about belief; at the extreme the dogma is so accepted unreflectively that meaning is no longer in the belief but in something like action or duty. In the other direction (positive) on the X scale is the movement towards skepticism, from ordinary doubt (agnosticism) to nihilism; at the extreme, doubt has become disinterestedness to the level of abandoning meaning in either belief or unbelief. Again, the point is made that there is a strange meeting with its extreme opposite. On the question of belief, the ritualist and the nihilist have a lot in common. Either meaning is somewhere else than belief or it is abandoned altogether. There are two ‘middling’ positions on either side of the scale. In academic debate, that is where most of the action is played out. Those who look towards dogma have substantively outlined a position known as fideism. There are some variants to the broad position – faith is independent of reason, or that reason and faith are hostile to each other and faith is superior in arriving at particular truths. However, the common idea is that belief is validated by faith. The middling position on the side of skepticism is – not surprisingly – modern skepticism of a variant which avoids difficulties in global skepticism or solipsism. There is a range of options, fallibilism or scientific skepticism, and on many specific questions there is much overlap, but the common idea is the reverse of the fideist’s position. Belief is not validated by faith but something else, usually an epistemological combination of reason, critical observation (empiricism) and scientific theory. An important note has to be made at this conjunction. The terminology used is drawn from the sub-discipline which is usually called, ‘philosophy of religion.’ It is a misnomer to think that the source limits its application to organised religion, or for that matter, organised secular humanist organisations. The academic arguments do not presuppose an apologia for dogma or skepticism. The sub-discipline ought to be called, ‘philosophy of belief’ (and inferring unbelief an underside of any belief). As has commonly been noted by many scholars, the characteristics of religions (and such is debated) are applicable beyond organised religion, to other forms of ideology, and hence, as its opposition, also concern those sets of beliefs that are theoretically anti-systemic – oppose beliefs that form a certain type of system. Furthermore, although we would expect those who are devoted to an organised religion or secular humanist organisation to be on one side of the scale or the other, both religious and secular thinkers can surprise us. Descartes was a famous skeptic and a religious thinker; and, of course, was initially condemned by organised religion. There are also many secular skeptics who discuss ‘spirituality’ in a positive light. Some may even engage it, whatever ‘it’ is. The important point is not to read Belief (X) Scale Value with any specific content of affirmation or disaffirmation. The scale only conveys the intensity or the nature of the belief response. One direction (negative) on the Y scale is the ideological movement towards liberty, from basic conservatism of a liberal democracy (liberty of traditions) to anarchism which has strangely become a violent reaction against the liberal state; at the extreme the libertinism is so total, that there is hegemony of egoism. In the other direction (positive) on the Y scale is the movement towards equity, from basic socialism, common to western democracies until the 1970s, to totalitarianism; at the extreme, egalitarianism has wiped away distinctions which we normally value in individuals. Again, the point is made that there is a strange meeting with its extreme opposite. On the question of an organised society, the anarchist or libertine and the totalitarian or egalitarian have a lot in common. Either social groupings are denied the support of a state structure, and hence, lack identification as a society (identification requiring an external process), or are made to completely conform to a state culture, so that the multiple-part society is indiscernible from the state. There are historically two common positions on either side of the scale, liberalism and socialism. Isaiah Berlin, as an historian of ideas and a political philosopher, has done the most in articulating the value pluralism and value conflict associated with the history of liberalism and socialism. Most citizens in liberal democracies want both liberty and equity, but, in practical terms, one usually discounts the other in political decisions. Hence, as a generality, political formations shift between those who value liberty higher and those who value equity higher. Needless to say, the umbrella of liberalism and socialism covers a range of very differing views on specific questions of political theory, ethics and lifestyles. Conservatism is also not a straightforward system of ideas. Conservatism is not simply about conservation of the past. It has to ask itself at what stage of a tradition does it evolve (and hence, voluntary change is required) and whose tradition prevails. The modern alliance system between conservatives and liberals against socialising forces is based much more on party pragmatics. It may seem odd intellectually, but historically conservatives and socialists have been much more closely aligned on particular questions of economics and morality. That conservative association is practically true for many communists. Communism is equally multi-faceted. Theoretically, the communist utopian society is stateless, akin to anarchism. However, history only has produced state communism and states having very differing dominant cultures means different versions. The Communist International has not been successful. As with the X scale, it is important to not link positions on the Y scale with organised affiliations. In regard to the Y scale, it is the personal socio-political ideology of the thinker. It is notoriously true that party politics often pays only lip-service to the described ideology. Self-described affiliations of the thinker does count much in the assessment, but the tone of the person’s pronouncements and associations has to weigh into the assessment as well. It is not an easy job, and accuracy will be work-in-progress. Assessments will always be up for re-evaluation.